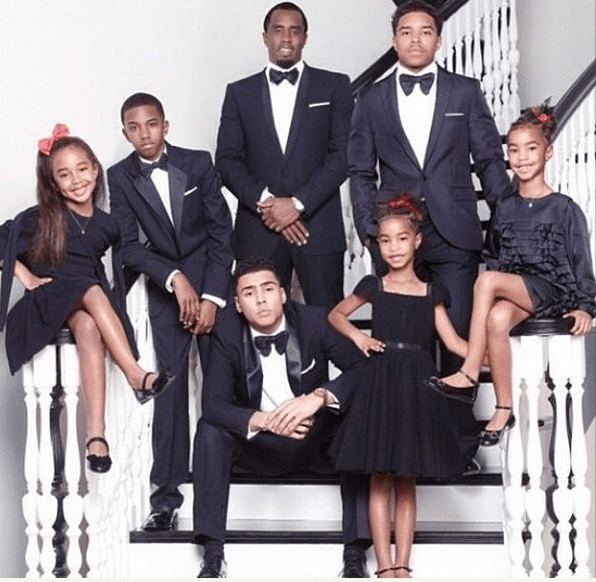 Pdiddy kids wow dad ‘ Sean Diddy Combs ‘ in a lovely photo. the 49 years old rapper posted photos of himself and his kids On Instagram days back. In the photo p diddy son Quincy sat on the staircase with one of the diddy daughters. Justin, Christia, and Chance took sides each to the record producer and rapper. Kim Porter and diddy twin daughters each sat opposite each other on the staircase. All seven pose for wonderful Xmas holiday photos. 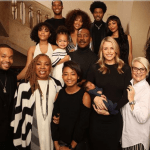 The death of Kim Porter got many curious, if the music mogul has 6 kids, then who are the mothers? so today Shoutmeceleb will bring it to your digest. First, how many kids P diddy have? p diddy have 6 kids. I bet you want to know their names too so, here we go. His kids are Quincy Combs, Justin Dior Combs, Christian Casey Combs, Chance Combs, D’lila Star Combs, and Jessie James Combs. 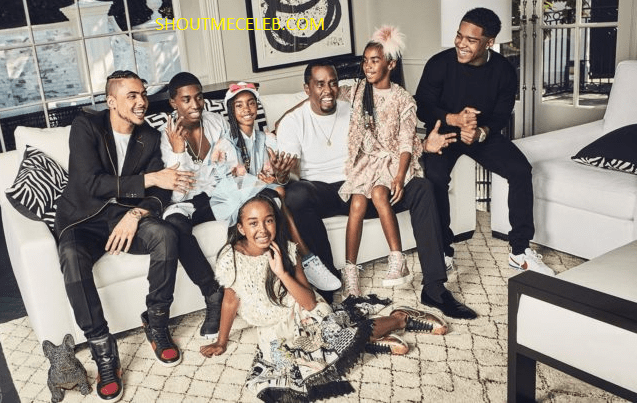 record producer puffy is the surrogate dad to Quincy Taylor Brown and eldest of Kim porter sons. You have been waiting for these! Okay! so, Kim Porter is the mother of Quincy Combs, Christian Casey Comb, D’lila, and Jessie. Sarah Chapman diddy ex girlfriend is the mother of Chance and Misa Hylton Brim gave birth to Justin. Quincy was born to biological father AI B Sure on June 4th, 1991, he is 27 years of age. He made a career in Music after and was a cast in the Movie ‘Brotherly Love’. Justin is an American football defender and his rise to fame began when he won a scholarship to play football. He is 23 years of age and grew up with his half-sister Chance, D’lila and Jessie. Twin D’lila and Jessie were born on December 21, 2006, and had their birthdays yesterday. Chance and his half-sisters were born in the same year but she was born 5 months earlier. Puff daddy famous American musician was once married to recently deceased Kim porter. Kim died who in her apartment last month but gave birth to 4 kids between 1998 and 2007. The couple bid their marriage farewell in 2007 after the birth of her twin daughters D’lila and Jessie. 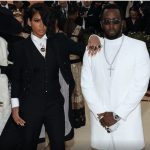 Kim and Diddy first started dating in the mid-1990s. In 1999 puff daddy broke up to seek love romance with Jennifer Lopez but the latter split up in 2001. In 2003 Sean Combs and the former model came back together. Misa Hylton was Pdiddy’s high school darling but cheated on her with Sarah Chapman Diddy and Kim Porter. She said I always considered Sarah and Kim as my sister but the latter two never got along. In 2005 she sued diddy for child support and he was fine with $249,000 by New York Court. Despite departing the two still maintained a solid relationship till date. Sarah Chapman P Diddy and the star both had Chance 5 month before Kim Porter’s twin was born. After the breakup between Diddy and Kim, the American rapper took full responsibility for Chance. The 47 years old funeral held in Columbus, GA and buried in Cascade Hill Church. Friends Family and well-wishers bid their farewell and the day was over. Sean John Combs according to Wikipedia was born on November 4th, 1969. He took on several stage names like Puff daddy, puffy and diddy. He is an actor and father of 6 kids, 4 of whom their mother died last month. 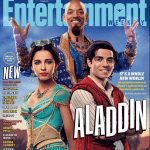 His career started in the 1990s which saw the rise to fame quick. He works as a Talent director and record producer before founding his own label. Bad Boys Entertainment formed in 1992 debut an album in 1997. In 1997 his album ‘ No Way Out ‘ became 7 platinum and his other success Album like Forever, Saga Continue, Press Play is a hit. Forbes 2018 list ranked the 2nd Richest Hip-hop record artist with a net worth of $825 million. Sean was born to Janice Smalls and Melvin Earl Combs. His mother was a teacher assistant and model, His father served in the US air force. Earl Combs has later shot to death in his car at age 33 while little diddy was tender. Some of the Pdiddy kids like Quincy and Justin are already attaining fame on their own. Although being born into wealth can make man to fumble, but a man that knows where he is going stays on course. What do you have to say about Pdiddy Kids, do you think Christian, Jessie, D’lila, Chance will make their own fame? Use the comment box to drop your comments. I have been blogging since 2015, I love the idea of making money from home. When am not blogging on my Entertainment website, I am probably teaching the student of my other website how to make money online. It is true I love to be happy and loyal because power is given to those who are loyal enough to bend down and pick it up. To know more about me visit my About Page.